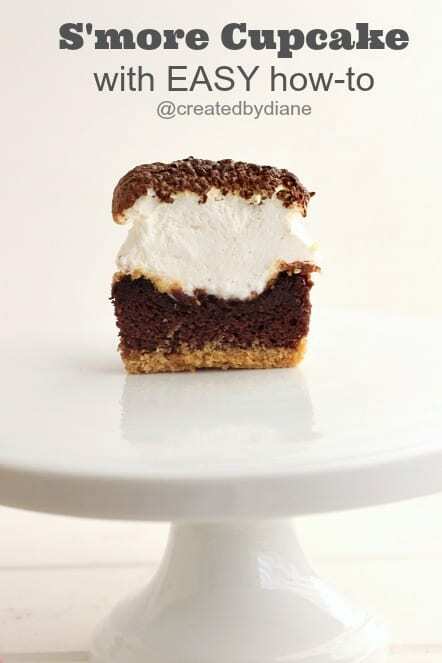 When you are craving a S’more…..these will definitely satisfy! I made many batches, to be sure there was enough graham cracker goodness in every bite. Bring out the big ones for this!!! use the bottom of a small measuring cup to pack it down, or a pastry tart tool, the back of a spoon will work, but a flat bottomed item will do it easier. 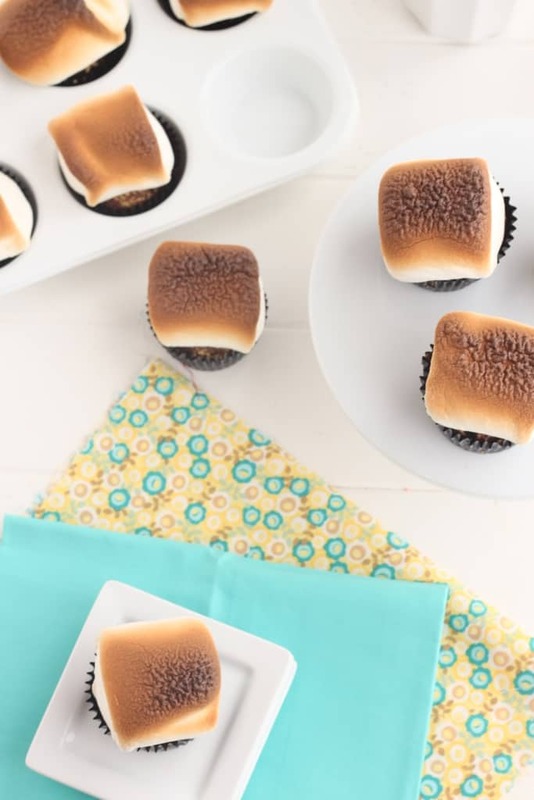 Then remove them from the oven, and place a giant marshmallow on top of them, pressing in lightly so they don’t fall off, but not so much that you squish the cupcake, just so they stay put. Carefully put the cupcakes back in the oven, with the broiler on high. Toasting the marshmallows will only take a minute to a minute and a half. Do no close the oven door, don’t take your eyes off of them, watch the magic happen. In no time, they will be all golden and toasted. I put my above the middle, I wanted them toasty! If you want them lighter, leave the rack in the middle, and watch them….carefully. As soon as you like the color of them take them out. You can always put them back in for a few more seconds if needed. NOW those are some TOASTY marshmallows! use a tart tool for pressing the mixture, back of a spoon, or the end of a mini rolling pin that is roundish at the ends, a small class or measuring cup will work well too. Watch them carefully, do not close the oven all the way...keep an eye on them, they toast quickly. 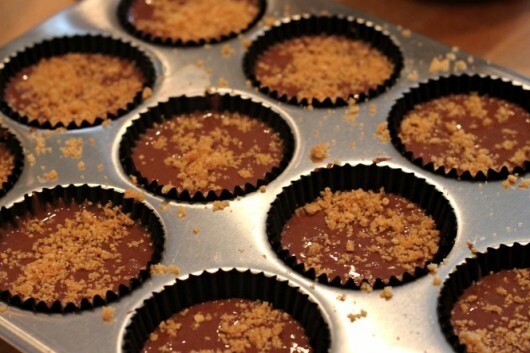 Remove from oven and let cool, then remove from cupcake pan and serve. I have made these with regular size marshmallows and it was not enough marshmallow. Wow! These are incredibly beautiful! I agree, very nice and executed very precisely. Well done! 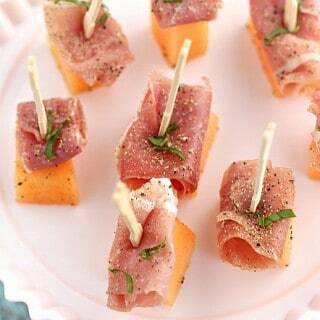 Beautifully elegant but delicious so. I agree, very nicely execute!!!! Great job Diane!! 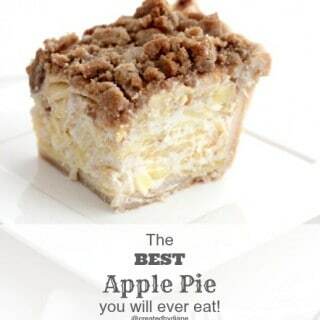 My kids love it especially my husband! 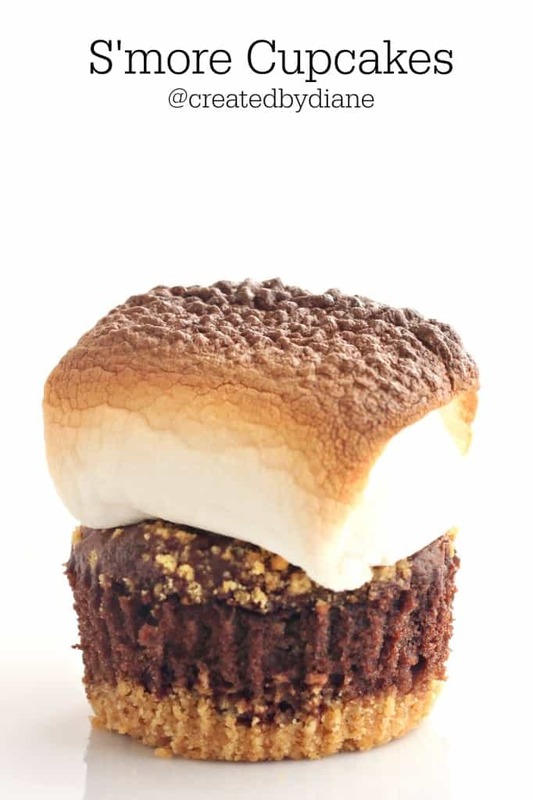 Let me through a vegetarian marshmallow on that cupcake and I’d be in heaven. 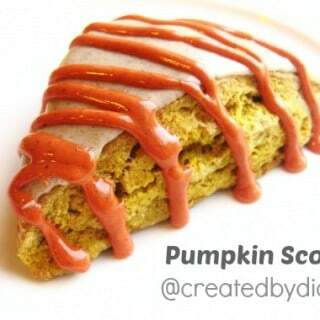 Love this recipe and your photos are beautiful!! These are the cutest, you crafty girl! Love them. thanks Sarah 🙂 the marshmallows remind me of mushrooms too! You could not have toasted those marshmallows any more perfectly. Gorgeous! I love how easy this is. FUN!!!! 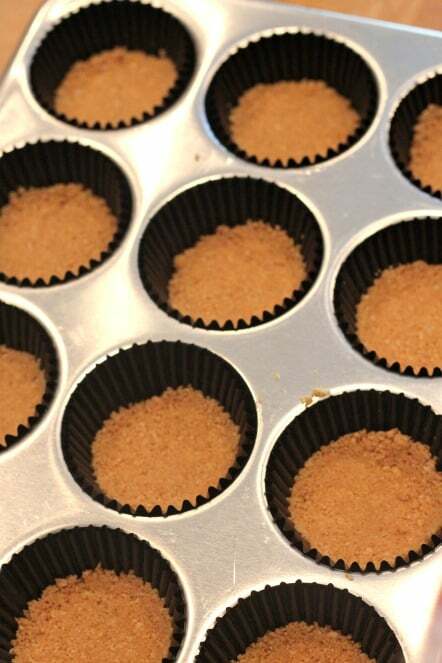 Do you use mini muffin/cupcake tins or regular cupcake tins when baking these? Can you make it with brownie batter instead of chocolate cake batter? 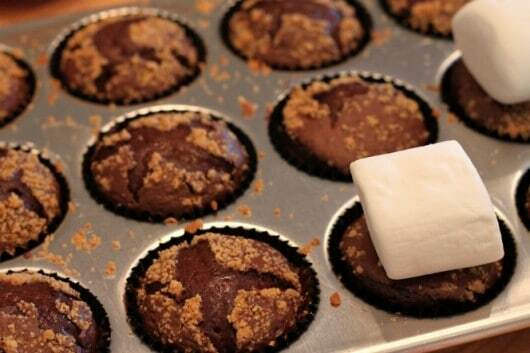 If I were to use mini cupcake pans, could I use regular size marshmallows? Yes you can use brownie batter, they won’t rise up as high as cupcakes, be sure to check how they are doing so you don’t over bake them. I have not baked them in mini pans, but I think the regular size would fit fine. Typical cake mixes yeild 24 cupcakes. It does depend if you fill them a little higher, that it would be a few less cupcakes. I use a three tablespoon scoop and am able to get 24 cupcakes. These cupcakes look delicious! Do you recommend serving the same day or how well does the marshmallow store? Thanks! I do recommend serving the same day, but they were good the second. 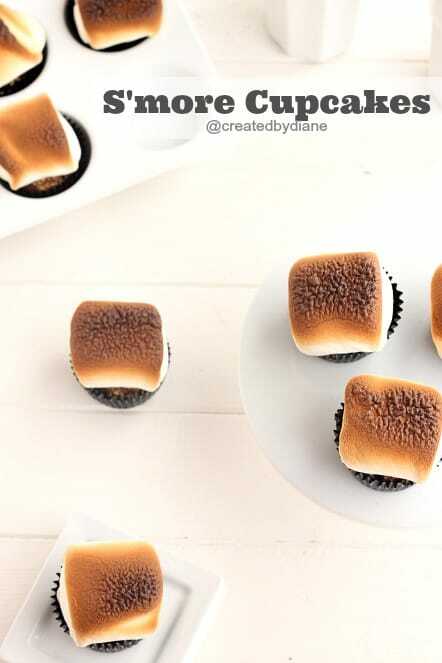 Do not put them in an airtight container as the moisture will make the marshmallow sticky. I had them on the counter and the second day they were equally enjoyed. 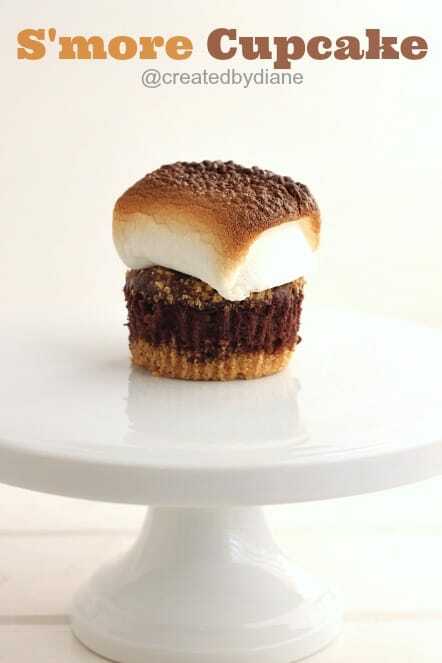 My daughter loves anything with s’mores in the name so I thought I’d try these! Giant marshmallows needed to be cut in half and cake batter reduced to 2 tablespoons. First batch east way to messy! I could hardly get them out of the tin! So sad I had to eat all the extra melted marshmallows! very good taste! 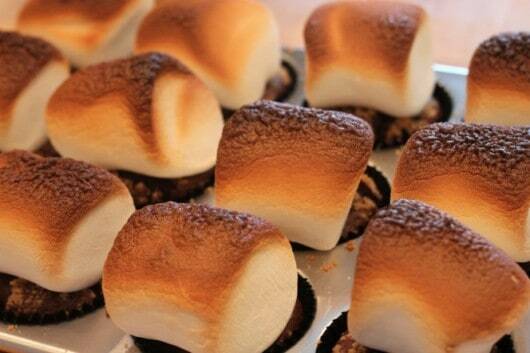 I baked many batches to get the proportions the way I felt they were best and cutting the marshmallows was not it. If you cook the marshmallows just right, golden no top on high heat they are perfect. If you cut them, they are really messy when heated (and flatten way to much-certainly won’t hold up to the remaining ingredients) and no where near as pretty either. Smaller marshmallows did not work well either. Like I mentioned I made MANY batches. The amount of cake batter is 3 tablespoons or they won’t bake up nice and fluffy, as they are then pressed down a bit when biting in and there won’t be a good ratio of chocolate. After all they are s’more and all three components are important here. I had many taste testers for these and made them a couple times before posting and I assure you if you follow the instructions they turn out like the photos I took. 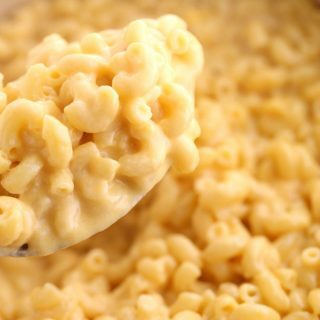 But of course you can make and enjoy them any way you prefer, but the 10+ people I had try them all agreed they were best in the amounts written.